Is Twitter's breakneck growth causing a backlash? (CNN) -- David Bill isn't annoyed when Twitter gets so bogged down with traffic that he can't post a message. 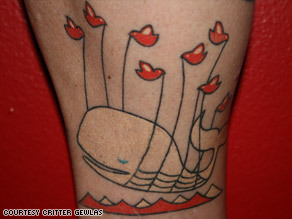 Twitter's "fail whale," which appears when the site is overrun, is so popular it's on T-shirts and even tattoos. That's because in the moment when frustration would hit, he's greeted on the popular Web site by a cartoonish image he loves: a giant whale being lifted out of an ocean by a small flock of tweeting birds. The icon -- which Twitter users call it the "fail whale" because the creature appears only when the site has failed to load -- has gained a cult following as the social media site grows at breakneck pace. The conversational Web site, which lets users post 140-character microblogs, saw a 1,374 percent jump in unique visitors between February 2008 and February this year, up to 7 million from only 475,000, according to Nielsen NetView. By comparison, Facebook grew 228 percent, to 65.7 million users, during the same period. With all of those new Twitterers, fail whale sightings and site crashes seem more frequent. Bill (mr_bill on Twitter) and other fail-whale followers aren't bothered, though. The 36-year-old San Franciscan has organized parties in honor of the whale. The most recent, held in California in February, was attended by more than 300 people, including Yiying Lu, the artist in Australia who created the image. Bill says the whale represents a contrarian philosophy. Which social network should I join? iReport.com: Loving or hating growth of Facebook, Twitter? "It's sort of an adorable whale but also this thing that represents the Herculean tasks that we sometimes go about from day to day," he said. "We're all trying to do a lot of things that seem pretty impossible," Bill said. "It's nice to identify something positive with those failures." Not every Twitterer is sympathetic to the site's troubles, though. Some users say Twitter has outgrown its core audience and is irrelevant to the technophiles who made it popular in the first place. Others are annoyed by the flood of spammers and profiteers who now use the site's popularity to make a buck. Celebrities and members of Congress have been jumping onto the site in recent months, adding to the site's mainstream popularity and, some users say, causing glitches in the system. "I keep getting the fail whale. Twitter got too popular too quickly. I blame Shaq," wrote Jessica Roy, a 21-year-old New York University student who goes by suchamessica on Twitter. Basketball player Shaquille O'Neal, or THE_REAL_SHAQ, has more than 470,000 followers on the site. Nova Spivack, a blogger whose article "Can Twitter Survive What is About to Happen to It?" has been passed around the site, said a rift is developing between Twitter's original "in crowd" and its newer, more mainstream users. Early adopters find many of the new users annoying, he said. "A lot of people come in, and they take that 'What are you doing?' question literally, and so they put very inane things on Twitter," he said. iReport.com: How do you feel about tweets and status updates? The site used to feel "insulated" from the mainstream, and now it doesn't, he said. But for all the complaints, there seem to be just as many people who are almost excited about Twitter's growing pains. It is inevitable that a Web site seeing Twitter-style growth would face some glitches and a backlash from early adopters, said Laura Fitton, a consultant and co-author of the book "Twitter for Dummies." "There's going to be all kinds of people using it all kinds of different ways," she said. "The purists can go pound rocks." Major news such as the Mumbai terrorist attacks and the Hudson River plane landing has broken over Twitter, and that's added to the site's popularity, she said. Amy Gahran, who writes on social media at contentious.com, said the backlash against Twitter stems from the fact that people are uncomfortable with change. Early users see new people coming to the site, and that creeps them out, but it shouldn't, she said. "Change is freaking good," she said. "Roll with it." As the site gets filled with fresh users, people are creating pieces of software to help Twitterers sort through the noise, Gahran said. She said Twitter is popular because it mimics real-life conversation and because it's easy to use. She also expects Twitter to expand, especially as people in developing countries use cell-phone text messages to communicate through the site. "People talk. That's what we do," she said. "We're social creatures. We're kind of wired for this." Twitter says it is addressing breakdowns in that wired communication. "We have made amazing progress from a technical perspective as far as accommodating this rapid growth goes and will continue to improve system and subsystem performance moving forward," Twitter co-founder Biz Stone wrote in a statement to CNN. Critter Gewlas of Cary, North Carolina, believes so much in the site's ability to overcome adversity that he recently got a tattoo of the fail whale on his leg. "The site itself has suffered a few scrapes and bumps along the way, but for the most part, I definitely think it's a good thing," said the 36-year-old. The fail whale's account on Twitter has more than 2,265 followers. A Facebook group dedicated to the whale has more than 4,400 members. The whale has spawned art and merchandise, from coffee mugs to baby clothes. A Current.com parody of the whale has spun around the Internet, too. Bill, whose fail whale parties have featured an aquamarine martini in honor of the icon's color, said the whale's popularity comes from the idea that failures are worth celebrating and learning from. Twitter will use that philosophy to continue to grow, he said. "Twitter is a powerful enough thing that it should succeed in a broad way, and I would like it to succeed in a broad way," he said.